The team from Openreach is currently working in Swinton, as part of the multi-million pound Fibre First programme, bringing reliable, ultrafast broadband to tens of thousands of homes and businesses across the city. Much of the work uses existing infrastructure but as part of building the network from the Swinton exchange to reach a group of around 15 properties close to Worsley, it was decided that an engineering first was needed – the use of a specialist drone. Brian Mellor, Openreach’s chief engineer in the local area, said: “Our work in Manchester is progressing really well as we extend our ultrafast network even further. We’re always looking for smarter ways of operating, to enable us to work quicker and in a more cost-effective way, as well as keeping disruption to local life to an absolute minimum. 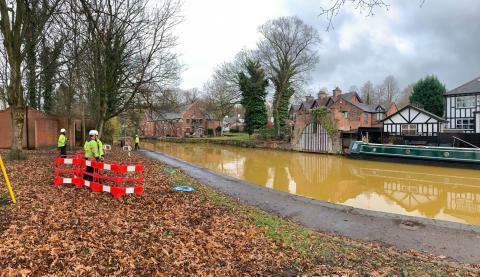 The challenge here was getting the cable across around 30 metres of canal, rather than choosing the conventional route that would have involved laying underground fibre cable over a far greater distance. “In the past we’ve tried all sorts of ways to cross waterways like this – including attaching cables to fishing lines, golf balls and even hammers, which frankly proved hit and miss. Engineers complete a week’s training to become certified by the Civil Aviation Authority in order to fly the drone for commercial purposes, and Openreach has five teams in the UK now approved to fly bespoke drones. Before taking the Manchester fibre rollout into the skies, Openreach had to notify and seek permission from a number of local organisations, including Manchester Airport. Earlier this year, the city was announced as one of the first places in the UK to benefit from a multi-million investment in ultrafast speeds by Openreach. As well as adding even more reliability and resilience to broadband connections and making them less likely to drop out, Full Fibre is capable of delivering download speeds of up to one gigabit per second (1Gbps) – enough bandwidth to stream 200 HD Netflix movies simultaneously. Matthew Hemmings, Openreach’s director for fibre delivery in the North of England, added: “Our engineers love nothing more than a challenge and our Fibre First rollout in Manchester has provided us with a great opportunity to test our skills. We’re constantly working on new techniques and technologies to help us take fibre broadband further and faster, and, importantly, to drive down our costs, which helps us go even further. Ultrafast Fibre-to-the-Premises (FTTP) broadband provides even greater capacity for multiple fixed and mobile devices and things like on-demand video, Virtual Reality gaming and smart home apps. The fibre connection will future proof homes and businesses for decades to come and ensure that Greater Manchester remains competitive on the national and world stage. The work is a further boost for the region, which earlier this year heard it would benefit from Openreach’s unprecedented recruitment drive: more than 280 new trainee engineers are being employed across the North West, including around 80 in Greater Manchester, to help deliver ultrafast broadband. According to the independent website thinkbroadband.com, more than 95 per cent of Manchester homes and businesses already have access to superfast broadband speeds of 24Mbps and above.